What do kids want? Stuff to do! And that’s what’s featured at Family Times Kids Expo 2018 (formerly Summer Fun & Camp Fair). The words “ boy scout” tend to summon an image of a kid in a tan button-up shirt, green shorts and a sash full of merit badges. If you’re seeking a place to raise a family, don’t overlook Camillus. Syracuse’s professional regional theater will break new ground this month with a performance of Mary Poppins geared toward the sensitivities of people with sensory, social and learning disabilities, including autism spectrum disorder. The 2016 Family Times Summer Fun and Camp was held in the State Fairgrounds Horticulture Building on Saturday, April 9. It gave more than two dozen performers and exhibitors a chance to inform parents, grandparents and kids about summer programs, camps and destinations. Hundreds of attendees left with a feel for opportunities for summer fun. What is your family looking forward to this summer? Hundreds of people flocked to Family Times’ Summer Fun and Camp Fair at the State Fairgrounds on April 11, drawn by the chance to plan their families’ vacations in one day. Looking for ideas to plan your family’s summer? Need details about day camps and other programs? That’s what Family Times’ Summer Fun and Camp Fair is for. By midyear, most of Onondaga County’s 650 spots at on-site educational programs for preschoolers with special needs are full, and some programs have waiting lists. When Children’s Village, an Onondaga-Cortland-Madison BOCES program at East Syracuse-Minoa’s Park Hill School, closes June 30, the waiting lists may get a little longer. Wacky spring weather (including a whiteout or two) did not deter the more than 2,000 people who came to Family Times’ Summer Fun and Camp Fair on April 5. The event, held in the State Fairgrounds’ Center of Progress Building and sponsored by Driver’s Village, featured nearly 40 exhibitors with summer programs, camps, destinations and services. Parents enjoyed getting information to plan their summers, while kids got to meet residents—including a camel and some goats—of the Wild Animal Park in Chittenango and bounce in the two inflatables. If there were a vaccine for breast cancer, she wouldn’t be able to close the office doors ever, says Dr. Linda Imboden of Brighton Hill Pediatrics in Syracuse. Yet nearly half the teenagers in the United States remain without the vaccine known to prevent most cervical and throat cancers. Whether they’re students in college, high school, or elementary school, everybody is trying to make a good impression, especially on the first few days. Representatives of some of Family Times’ Besties Readers’ Picks competition winners stopped by the office last month to collect their awards and get their photos shot by Michael Davis. We’d like to thank everyone who voted in the 2013 competition for showing their support for these local organizations. In the second year of the Summer Fun and Camp Fair at the State Fairgrounds Horticulture Building—and ninth year of the event itself—Family Times welcomed hundreds of visitors eager to check out the exhibitors’ tables. Dozens of summer programs, camps, destinations and other businesses captured the interest of parents gathering information about how they and their kids want to spend the warm-weather months. Family Times’ entries placed first (two awards), second (one) and third (one) in the most recent competition of the magazine’s national industry group, the Parenting Media Association. This year the participants in Family Times’ fifth annual drawing contest came from third-, fourth- and sixth-grade art classes of Patricia Bonfe and Timothy Howard, who teach at H.W. Smith K-8 School at Levy, located at Fellows Avenue and Harvard Place in Syracuse. A new venue gave Family Times’ Summer Fun and Camp Fair a fresh look, more space and the opportunity to bring different kinds of exhibitors to the eighth annual event. 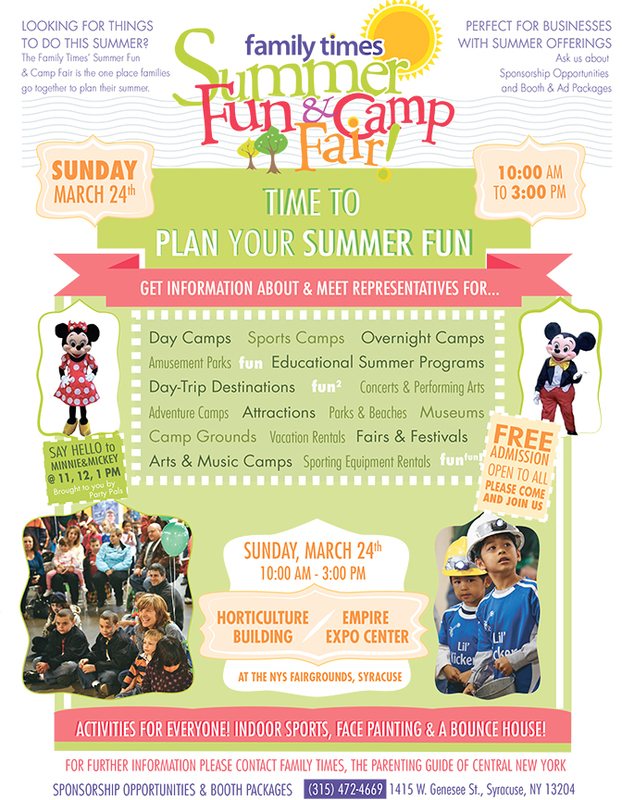 You didn’t imagine that Family Times’ Camp Fair could possibly be even more fantastic, did you? Family Times and its sister publication, the Syracuse New Times, support many charitable organizations through donations of cash and advertising. One nonprofit organization, Upstate Golisano Children’s Hospital, recognized the company’s efforts on Oct. 26 by giving Family Times and the Syracuse New Times a certificate for their role as a Media Champion. For the fourth time, Family Times: The Parenting Guide of Central New York held a drawing contest on the theme of winter fun for the December issue. Every year a different Central New York school or school system is chosen to submit artworks for the contest. This year Kyle Mort, Camillus Middle School art teacher, presented the contest to his sixth-grade students. Sixty-six students submitted entries. Staffers from Family Times’ Creative Services Department selected a winner, whose drawing appears on the cover, and five honorable mentions, pictured here. We thank Kyle Mort and the Camillus Middle School students who took part in the contest. It was our great pleasure to see these students’ imaginations at work. Every fall brings a new crop of photogenic faces to the Family Times offices as we review entrants in the annual Cover Kid Contest. Family Times won three awards in the annual Parenting Publications of America 2011 competition. The DeWitt Police Department has made technology-related crimes a key aspect of its youth education program. Family Times Cover Kid Contest judges once again faced a challenge to come up with four winners out of dozens of entries in the seventh annual contest. Last year, Cazenovia Children’s House teachers asked the parents of school-age children to vote on whether the use of hand-held electronic gaming devices, cell phones and MP3 players should be restricted. After reviewing various opinions, administrators banned the devices. It all starts here,” said presenter David Lowenstein, now of Cazenovia SummerStage. Lowenstein was one of the most experienced voices at the fifth annual Syracuse Area Live Theatre Youth (SALTY) Awards, on May 23. Once a mainstay of Syracuse community theater companies, Lowenstein rose to become a successful Broadway performer, and recently he has returned to the area to work for the Syracuse University Drama Department and for Cazenovia College. Parents submitted 94 charming photos of their children to the sixth annual Family Times Cover Kid Contest, and the judges had a difficult series of choices to pick a single winner in each of the four categories for young people ages 2 to 16. A hearty, boisterous crowd turned out at Cicero-North Syracuse High School Auditorium on June 6 for the presentation of the SALTY (Syracuse Area Live Theatre Youth) Awards and a series of scenes from shows that rivaled the best that any company put up all year. Over the past three years, the Syracuse Area Live Theatre Youth (SALTY) Awards have grown and evolved. We have changed the awards to enable more people to participate in selection of winners. Camp Fair 2009 gave some 50 summer programs, and residential and day camps a chance to talk to families and potential participants and help them make plans for the long vacation. Looking for a special gift for a child? Area independent toy stores offer unusual items and personal service not available at your typical big-box store. Proud parents submitted 106 photos of their children in Family Times’ fifth annual Cover Kid Contest. Children ages 2 to 12 were eligible to compete in one of four age categories. “Let me know if I can do anything.” It’s the empty, yet sincere, offer most of us make to family or friends struggling with illness or grief. You sign up for e-mail updates, or you make that long-distance call but, too often, one feels powerless to help. The Syracuse area now has a new cloth-diaper delivery service, after going without since Cottontails folded at the end of 2004. Syracuse is home to a wealth of theatrical talent, much of it nurtured in area high schools and local community theater companies. The area’s theater community gathered on May 18 to honor its youngest stars, and those who work with them, at the SALTY (Syracuse Area Live Theatre Youth) Awards. The ceremony was held at the New Times Theater on the State Fairgrounds in Geddes. Talented local young people get a chance to shine on Monday, May 19, when the Syracuse Area Live Theatre Youth (SALTY) Awards are presented. We make no bones about it—at Family Times we like winning awards, and we were pleased to land a couple in the most recent national competition with peer publications. On a recent Saturday afternoon, near-deafening squeals of delight resonated throughout the Milton J. Rubenstein Museum of Science & Technology (MOST). A descent to the lower level revealed the uproar’s source: dozens of children climbing, crawling, running, sliding and jumping in a nine-level, 40-foot-high maze. Most parents aren’t professional photographers—but when it comes to taking stellar shots of their children, they’re often the best people for the job. The recent decision to locate a public umbilical cord blood bank in Syracuse will give area parents a chance to donate a valuable product of birth that might otherwise become medical waste.